UK Twitter users divided over Islam may have fallen victim to Russian trolls, according to a research group which analyzed over 9 million tweets. A report released Thursday by the UK's cross-party Demos think tank shows that a St. Petersburg "troll farm" tweeted far more about Islam than Brexit, reports Bloomberg. Using a Twitter-provided data set of 3,841 blocked accounts said to be linked to the Internet Research Agency, the study shows how accounts "camouflaged" themselves after their creation in 2011 by tweeting innocuous things about exercise and fitness in order to appear genuine, before becoming politically active to divide people. Demos adds as a caveat that they are "dependent on Twitter's determination that these are indeed Russian state-operated accounts." 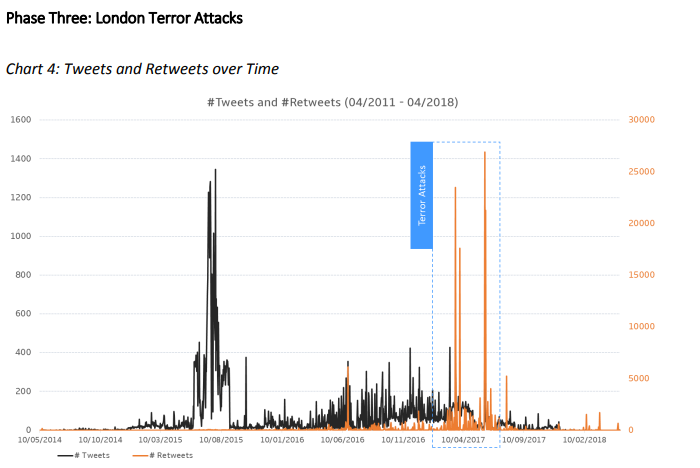 There were three phases in Russian influence operations: under-the-radar account building, minor Brexit vote visibility, and larger-scale visibility during the London terror attacks. Russian influence operations linked to the UK were most visible when discussing Islam. Tweets discussing Islam over the period of terror attacks between March and June 2017 were retweeted 25 times more often than their other messages. The most widely-followed and visible troll account, @TEN_GOP, shared 109 Tweets related to the UK. Of these, 60 percent were related to Islam. The topology of tweet activity underlines the vulnerability of social media users to disinformation in the wake of a tragedy or outrage. Focus on the UK was a minor part of wider influence operations in this data. Of the nine million Tweets released by Twitter, 3.1 million were in English (34 percent). Of these 3.1 million, we estimate 83 thousand were in some way linked to the UK (2.7%). Those Tweets were shared 222 thousand times. It is plausible we are therefore seeing how the UK was caught up in Russian operations against the US. Influence operations captured in this data show attempts to falsely amplify other news sources and to take part in conversations around Islam, and rarely show attempts to spread ‘fake news’ or influence at an electoral level. In other words, the suspected Russian bots weren't spreading fake news - they were amplifying legitimate news sources. Of the nine million tweets analyzed, a staggering one thousand four hundred and sixteen (1,416, or 0.0015%) were "messages sent by Russian state-operated accounts" after three London Islamic terror attacks, and were "widely shared on the platform." The 1,416 tweets were retweeted 98,499 times - however Demos notes that they "cannot tell how many of these retweets were from other state-controlled or otherwise malicious accounts." we cannot say with confidence what proportion of Russian state-operated accounts that were active over the period the data represents. Although this is a useful window into Russian influence operations, we cannot be sure it is a representative one. We are equally dependent on Twitter’s determination that these are indeed Russian state-operated accounts. One of the major questions that this analysis cannot answer is whether this data set reveals Russian operations against the UK directly, or a small part of a Russian operation against the USA which happened to include UK-related messaging.